The Berghaus men's Asgard Hybrid Hydrodown® and Hydroloft® Jacket will become a favourite companion on your winter adventures in the mountains. One of the most successful products developed by the MtnHaus® design and development team, this jacket is packed with high performance and very effective materials and features. The Berghaus men&apos;s Asgard Hybrid Hydrodown® and Hydroloft® Jacket will become a favourite companion on your winter adventures in the mountains. One of the most successful products developed by the MtnHaus® design and development team, this jacket is packed with high performance and very effective materials and features. Body mapped insulation and a PERTEX® QUANTUM® face fabric will provide warmth where it&apos;s needed most, keep the elements at bay and allow you to stay active in comfort. Other features on the Asgard Hybrid include a fixed, helmet compatible hood and three handy zipped pockets. Whether you&apos;re bedding down on damp ground or climbing in less than perfect conditions, this breakthrough technology from Berghaus keeps you and your kit dry, warm, comfortable and light. 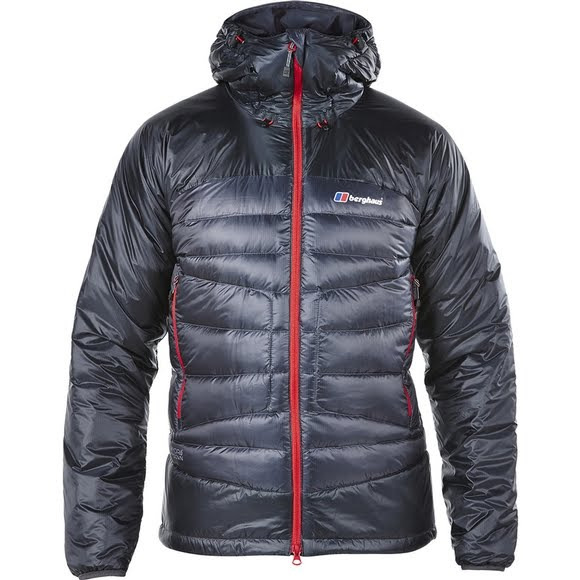 Pioneered by Berghaus, Hydrodown® is a revolutionary new take on nature&apos;s greatest insulator. By treating goose down with a durable water repellent (DWR), we&apos;ve created a material that resists rain longer, dries quicker, and retains its insulation even when it&apos;s damp. And just like untreated down, it has amazing warmth-to weight ratio which no synthetic alternative has come close to matching. Hydroloft® is a synthetic form of insulation that is formed out of super fine polyester fibres. It mimics the behaviour of down by trapping body heat using small pockets of air, but as it is synthetic, it continues to perform when wet and it does not migrate around a product. Because Hydroloft® does not migrate, Berghaus is able to combine it with less tightly woven inner and face fabrics, allowing perspiration to escape while the wearer is on the move and significantly increasing the comfort delivered by finished products when in use. MtnHaus products and technologies are tested to destruction and refined until we are confident that they will stand up to any challenge, so you can be confident that your gear will work where it matters most ï¿½ when you are on your next adventure.